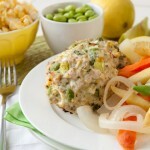 Chicken patties stuffed with fresh leeks, edamame, corn, and lemon zest. Preheat oven to 375F and line a baking sheet with a silicon baking mat or parchment paper. Set aside. Cook edamame and corn by boiling water in a medium-sized saucepan. Add edamame and corn, boil for 4 minutes. Strain and set aside. Add all ingredients to a large bowl and mix with hands until incorporated. Measure 4oz. or a heaping ? cup for each serving and place each on prepared baking sheet. Cook patties in preheated oven for 20-25 minutes, or until internal temperature reaches 180F. 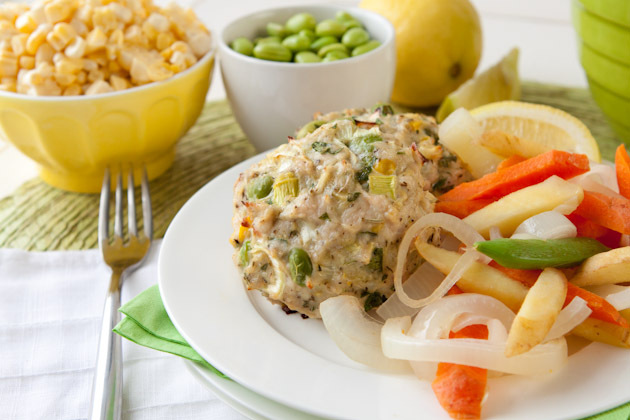 Serve with steamed veggie salad (below) or stuff into a gluten-free wrap or burger bun. If you practicing food combining and don’t want to add the edamame, feel free to replace with additional veggies – peppers, onion, zucchini would work well. If you’re allergic to corn, feel free to replace with additional veggies – peas, peppers or omit completely.